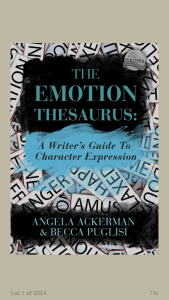 The Emotion Thesaurus is one of a collection of books by Angela Ackerman and Becca Puglisi, the others being The Positive Trait Thesaurus, The Negative Trait Thesaurus and Emotion Amplifiers. The first three are available in paperback or kindle versions; the last is a free, small kindle-only volume, and works as a good introduction to the others. The Emotion Thesaurus contains 75 emotion entries, ranging from adoration through nostalgia to worry. Each entry includes a definition (for example, Terror: a state of extreme fear), a long list of physical signals (ranging from images like flaring nostrils to behaviours like spinning around, trying to spot any and all danger), internal sensations (weak legs), mental responses (risk taking), cues of acute or long-term terror (insomnia, hallucinations), indications of how that emotion may escalate (paranoia, rage), cues of that emotion being suppressed and writer’s tips. Each of the entries offers a couple of pages of words and phrases. In the kindle version, there is a handy link back to the table of contents, as this is not the sort of book to be read linearly. 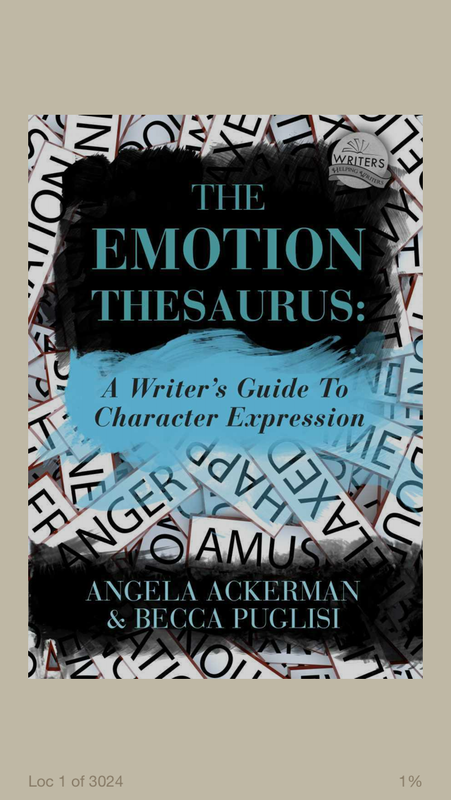 The book also contains general advice on writing emotions, and a guide to using the contents of the thesaurus. The Positive Trait Thesaurus and the Negative Trait Thesaurus are on similar lines. A guide at the front of the book gives guidance on creating believable, rounded characters. Then the main thesaurus lists different attributes, A definition is included, a guide to similar flaws/attributes, possible causes, associated behaviours and attitudes, associated thoughts, associated emotions, positive aspects, negative aspects, examples from film, overcoming this trait as a major flaw, and traits in supporting characters that may cause conflict. There is a wide range of traits included, with several under each letter of the alphabet. Smallest category is XYZ, containing only Zealousy, while several letters contain more than twenty entries. The free Emotion Amplifiers book is much briefer, but covers topics including addiction, attraction, boredom, hunger, illness, pain and stress, plus a sample of the other books in the series. These books are ideal for any writer who is seeking to widen the range of emotional description, covering multiple suggestions for describing just about any characteristic or emotional state you could think of. The Positive Traits and Negative Traits book would also be invaluable in the creation of rounded characters, whether you want to create a flawed hero or a well-rounded bad guy. While I found the paperback versions a little expensive, there’s no doubt that the physical book would be useful. However, the link to the index at the end of each chapter makes the kindle version perfectly valid as an alternative. This entry was posted in Writing book reviews and tagged editing, resources, writing on September 16, 2015 by Lin White.